8 Loaves of our Banana Nut Bread My homemade moist, sweet, and tasty, banana bread is popular with our many guest of whom drive for miles just to purchase a few loaves to enjoy at home. Made with lots of sweetly ripe banana’s and crunchy walnuts my banana bread is so moist and tasty. 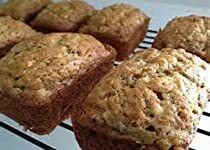 Unlike many other banana bread recipes or bakers, I use a generous amount of bananas to make our Banana Nut bread, doing this insures a very moist bread that actuallyhas a banana flavor. When you combine the extra bananas and the tasty crunchy walnuts you come up with a great tasting bread that’s hard to match. I find it almost impossible to not help myself to a piece of my Banana nut bread every time I bake a batch, my Daughter finds it quite funny to catch me snitching a half a loaf of fresh bread for myself. Of course she has to finish off the other half of the bread, just so it doesn’t go to waste.You will enjoy the rich moist flavor of our bread that is baked fresh everyday.Your order will be sent out fresh baked within 24 hours of your ordering it.You will appreciate that Beckeys has been making our banana bread for their restaurant guest to enjoy for close to 20 years now it’s as popular today as it was back then. We still make and bake the bread from scratch every morning just like your Grandmother would have so many years ago. I guarantee you will like our Banana Nut Bread, made with ripe flavorful bananas and crunchy tasty walnuts.Order your demi sized loaf of bread today and we will send a second one at no extra to you. Order two loaves and we will send two extra ones, for every loaf you order we will send one more. My Banana Nut bread makes great gifts for friends, family, or co-workers, it also freezes very well for later enjoyment. Pop a loaf into your Micro wave for about 20 seconds for that warm freshly baked aroma and taste.